I was happy to read the other day that the next FTD release will be the Las Vegas dinner show recorded on August 13, 1970. At the same time I was a bit surprised, as the import label Audionics put out exactly the same concert just a week ago or so. The battle between the bootleggers and FTD seems to be in full swing! Unimaginatively called The Wonder Of You (I've written about dull FTD titles before) it will be the fourth TTWII show released by BMG/FTD, which means only two are left in the can. I guess they too will see the light of day in a not to distant future. As much as this pleases me I can't help feeling a bit sad that FTD didn't think of releasing all six shows in a deluxe box set from the beginning (the first three shows were released in 2000 and 2001). And, after reading a review of the unofficial CD/DVD package That's The Way It Is: The Complete Works in the latest The Man And His Music magazine, it really annoys me that there isn't an official release like that in sight. But back to the dinner show from the 13th. About half of the songs have already been issued officially, on releases such as the 3 CD box set That's The Way It is: Special Edition and the FTD book/CD project The Way It Was. Personal favourites are "Stranger In The Crowd" and "Make The World Go Away." 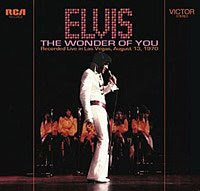 I'm really looking forward to The Wonder Of You which will make its appearance on June 29, if all goes according to plan. That certainly doesn't seem to be the case when it comes to the FTD vinyl versions of Blue Hawaii and Standing Room Only, as they are now rescheduled once more. This time the date coincides with the one given for the The Wonder Of You.